PR domain zinc finger protein 14 (PRDM14) is a member of the PRDI-BF1 and RIZ homology domain containing (PRDM) family of transcriptional regulators. PRDM14 may possess histone methyltransferase activity and plays a critical role in cell pluripotency by suppressing the expression of differentiation marker genes. Expression of PRDM14 may play a role in breast cancer. 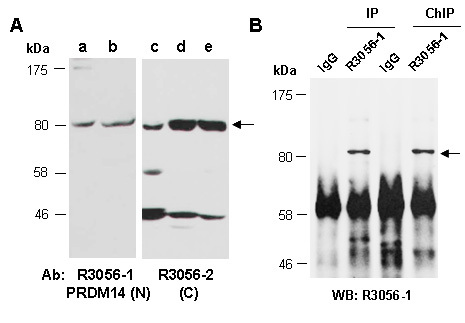 Rabbit polyclonal antibodies were produced by immunizing animals with a GST-fusion protein containing the N-terminal region of human PRDM14. Antibodies were purified by affinity purification using immunogen. Fig 1. (A) Western blot of total cell extracts from a,c. mouse thymus; b,d. human HeLa; e. human Jurkat; using 2 independent Abs against 2 distinct regions of human PRDM14 at RT for 2 h. (B) Total extracts from human HeLa were immunoprecipitated (IP) with IgG or anti-PRDM14 (N) (R3056-1) under the conventional IP conditions or cross-linked chromatin immunoprecipitation (ChIP) conditions; followed by WB with the same Ab and Rabbit IgG light chain-specific 2nd antibody.